One Man's Lonely Adventures In His R33 Skyline GT-R: Pricing on the Tomei Powered EXPREME Ti All Titanium Exhausts for R32, R33 and R34 GT-Rs! Pricing on the Tomei Powered EXPREME Ti All Titanium Exhausts for R32, R33 and R34 GT-Rs! 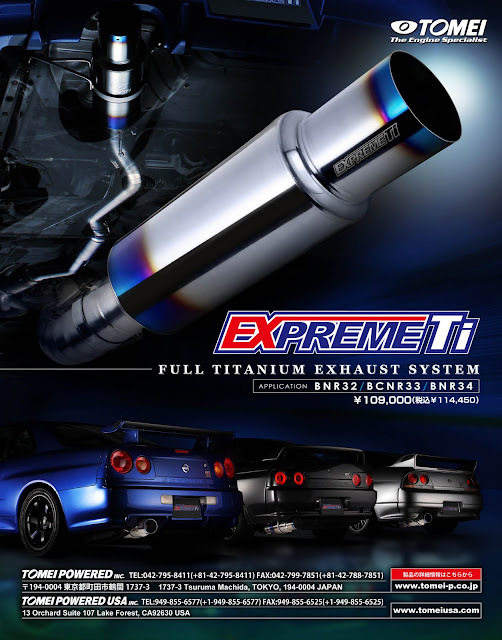 Well as promised – here is the advert for the new Tomei Exhausts, to be in the December issue of GT-R Magazine. You can see all three models lined up – but more importantly, pricing. 109,000 yen, which is 114,450 with sales tax included!! Of course, this is local JDM pricing, so overseas, I don’t know what the pricing will be. 1) Mine’s Silence VX-Pro Titan III (for R32, R34 only) – 270,900 Yen with tax. Specs – 78-80mm pipe, outlet is 120mm. 2) Powerhouse Amuse: R1 Titan – for all three models, but 187,950 Yen with tax. 3) HKS – uh, could not find a titanium muffler in their lineup. 4) Trial – Titan Bazooka Muffler series for all three models, but 197,400 Yen with tax. Specs – 80mm pipe, outlet is 115mm. 5) Ganador – for all three model cars. They have two exhaust models, Vertex Titan for 281,400 Yen with tax and the Racing Titan for 249,900 Yen, with tax. Only specs listed are the outlet size, first one is 120mm and second is 110. For all three models. Two models for R34, one with and one without a resonator (to quiet down?). R32 and R33 are normal model only. 278,250 yen without (ie normal) and 294,000 yen with. Anyway – the point is, for the specs and the pricing, you can’t beat Tomei. The Tomei pricing, in fact, is LOWER than prices of some of the USED full titanium exhausts that I found on Yahoo Auctions! Now, when will they be available? THAT my friends is what we all want to know and are eagerly waiting for. I suppose a bit of a ramp up time is inevitable, but it sure would be nice to be able to have one on my car before the next Fuji Speedway trackday with SSCT scheduled for the 23rd of December. I didn't see the piping size of the Tomei titanium exhausts. You posted the sizes of the other brands, but not the Tomei. That's too bad. I have a 100mm titanium on my R32 GTR and was wondering if any of the companies, including Tomei, offered that size. I don't want to go smaller than 100mm. I think mine is an old Apexi 100mm that they no longer make. I am surprised that no companies are manufacturing this size any more. First R33 GT-R in Japan with R35 Brakes!